Bodybuilders usually focus on protein to help enhance muscle growth and repair. Dietary fat, however, is also essential to maximal performance in the sport. Not just any fat will bring about positive health and physique changes. You need to focus on the right kinds and sources of fat to support your bodybuilding goals. Certain types of fat can help a bodybuilder maintain lean muscle mass, especially during a dieting phase. Ironically, adequate fat consumption can also maximize fat loss and help you build lean muscle. Fat in your diet supports hormone production, which is essential to muscle-building. It also helps you absorb and store essential vitamins, such as A, D, E and K. Fat is your primary energy source. Depriving your body of fat also encourages it to store extra fat whenever the opportunity arises to offset potential scarcity. Bodybuilders seek a lean, not fat, physique to show off muscles. Polyunsaturated fats are found in vegetable oils, such as corn, soybean and safflower. You also obtain polyunsaturated fats, specifically omega-3 fats, in fatty fish, walnuts and sunflower seeds. Omega-3 fats are a type of polyunsaturated fat that are essential to heart health and brain development. Omega-3s are critical for bodybuilders as they help you burn fat, rather than store it. Omega-3 fats may also help protect your joints and combat depression, an occasional side effect of the rigors of bodybuilding training and dieting. 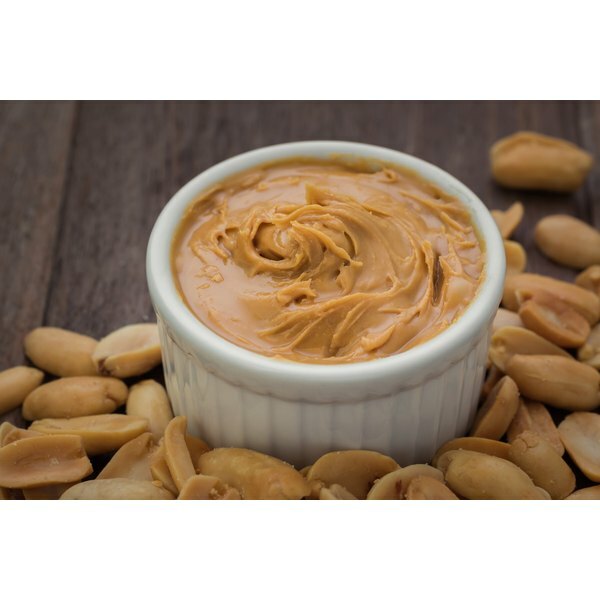 Olive oil and peanut butter are high in monounsaturated fats. The body processes monounsaturated fats efficiently, making them important in a bodybuilding diet. Monounsaturated fats, as with all fats, are a concentrated source of calories which can help during a bulking phase of training. Replacing saturated fats with monounsaturated fats may also improve your heart health, good for bodybuilding athletes and nonathletes alike. Monounsaturated fats help keep you feeling satisfied and prevent highs and lows in blood sugar, which can lead to irregular energy levels and cravings for simple carbohydrates. Saturated fat, found in animal meats, butter and full-fat dairy, can raise your risk of developing heart disease. For anyone, including bodybuilders, the American Heart Association recommends limiting intake to less than 7 percent of total daily calories. Trans fats are a man-made fat found in processed snack foods and many commercially fried items. These fats both elevate your bad cholesterol levels and decrease your good cholesterol levels, making them a poor addition to anyone’s diet. Eating a clean bodybuilding diet consisting of unprocessed, whole and natural foods helps you steer clear of trans fats.